After nearly two decades in the peloton, FDJ is one of the most well-established teams in the sport’s top level. Longevity doesn’t always equal results, however, and the French squad underperformed in 2015, finishing 15th out of the 17 WorldTour-level teams. Thibaut Pinot is the team’s brightest prospect. Success in the 2014 Tour de France propelled the him into the limelight – something which can be almost unbearable for French riders as the weight of a nation is placed on their shoulders every July. Nevertheless, Pinot delivered a 2015 Tour stage win and backed this up with a set of solid top five overall positions in races such as the Tour de Romandie, Tirreno-Adriatico and the Tour de Suisse. He finished the season as 10th rider in the UCI WorldTour. Arnaud Démare is the squad’s nominated sprinter, but has so far failed to match the pace of key rivals such as Mark Cavendish, Marcel Kittel and André Greipel in the biggest races. Other than those two, it’s a case of take your pick from a fairly nondescript French line-up. Kévin Réza will always get the ‘he’s decent in sprints’ treatment from the TV commentators, while Jérémy Roy is starting to become more well-known for his consistent uploads of on-bike footage from whichever breakaway he’s found himself in on that particular day. 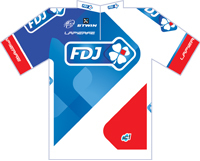 FDJ are currently propping up the French WorldTour representation alongside Ag2r-La Mondiale. And with Pinot in their ranks, they’ve always got a chance of taking something from the big stage races. French team FDJ will be called Groupama-FDJ from next season after securing new sponsorship from insurance group Groupama and with it a big budget increase. FDJ team leader Thibaut Pinot appears to be riding what we suspect to be a new, custom painted Lapierre Aircode at the Giro d'Italia. Arnaud Démare (FDJ) won the first stage of this year's Paris-Nice ahead of Julian Alaphilippe (Quick-Step Floors) in a chaotic day in northern France.